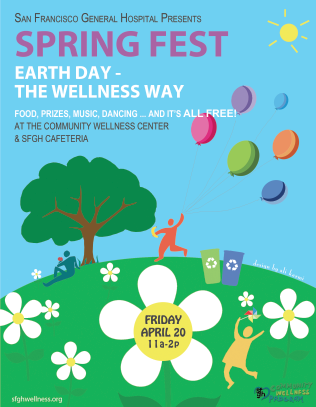 The San Francisco General Hospital (SFGH) Community Wellness Program is hosting Spring Fest in the hospital’s 2nd floor cafeteria and Community Wellness Center. We’ll be celebrating with energizing activities and exciting festivities. It’s all happening on Friday, April 20th, 11am – 2pm. · Spring Fest’s theme, Earth Day the Wellness Way will get us all in the Earth Day spirit of promoting a healthy, sustainable planet and community! We’ll be boogying to rhythmic drums, dancing to world beats, sharing healthy snacks, and more – and it’s all FREE! · We’ll be featuring wellness programs and product samples that are harmonious with the Earth Day message. · SFGH’s Community Wellness program is a burgeoning initiative that’s already engaging staff, patients, their families, and all San Franciscans in programs and services geared to enhance physical, emotional, mental, and spiritual health and well-being. · We serve a unique community and are working to ensure that the programs and services we develop build upon participants’ strengths, abilities, and interests; are linguistically and culturally accessible; and are useful , relevant, and fun. · Come and join in on the fun! See you at Spring Fest!